Thank you for visiting my Trustee Website. For those of you who have not met me yet, let me introduce myself. I am your local school trustee. I am your link with the Toronto District School Board, which governs Toronto’s public schools. As your elected representative, I make decisions with the rest of the trustees on the Board and act as your advocate and ‘sounding board,’ should the need arise. I believe we all have a role to play to help our public schools thrive. What does a trustee do? Enjoy this short video - TDSB Trustees. We are, more than ever, focused on ensuring that all students have access to the programs, opportunities and supports needed to reach high levels of achievement and well-being. This priority is driven by our newly approved Multi-Year Strategic Plan, which outlines our mission, values and goals in support of student success. To read the full plan, visit www.tdsb.on.ca/mysp. Your involvement in your child’s education and school life will contribute to their success. There are a number of ways you can get involved – to explore these opportunities please speak to your classroom teacher, School Council Chair or Principal or visit www.tdsb.on.ca/Elementary-School/Get-Involved. 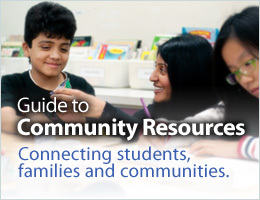 As the new school year begins, you will find helpful resources for both parents and students here www.tdsb.on.ca/About-Us/Innovation/Welcome-Back. Information includes homework tips, transportation updates and supports for mental health, healthy living and anti-bullying. This website is intended to support and encourage your direct participation in our public school system. Here you can learn about items of interest, opportunities to be involved such as Ward Forums, access up-to-date information or learn about school councils or read my weekly updates (via the links on the left-hand side of this page). If you are unable to find the information you need, please feel free to contact Araz Hasserjian – TDSB Administrative Liaison who will be supporting me and will answer the Trustees shared line during office hours. Araz can also be reached directly at 416-397-3061 or via e-mail at Araz.Hasserjian@tdsb.on.ca. If you would like to stay regularly informed on what is happening at the Board, including meeting agendas, policies under review, program updates, and discussions around new initiatives to improve student success and well-being, you can read my weekly e-update; to receive it, click on the link at the top right of this page. I am always looking to learn more about your local school successes, issues and priorities. If you have something to share or wish to speak with me directly, please do not hesitate to e-mail me at Shelley.Laskin@tdsb.on.ca or call and leave a message at 416 395-TRUS (8787). We may be the largest school board in the country, but it’s the relationships that make our schools feel like family. By getting involved, you’re supporting public education, and I look forward to working in partnership with you and your child’s school this year. Check "Other Items of Interest" for current issues. The official school year calendar for the Toronto District School Board runs from September 1, 2018 to June 30, 2019, inclusive. Click on "School Year Calendar 2018-19" for the complete listing. The TDSB is a large organization but we want to help you navigate to ensure that your questions and concerns are addressed by the appropriate person. Get a full list of all TDSB contact information. Read the Parent Concern Protocol.